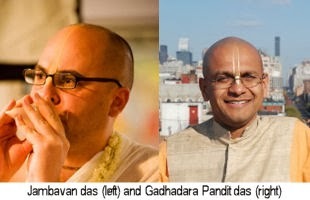 Welcoming Jambavan das and Gadhadhara Pandit das to Toronto this Week ~ The Toronto Hare Krishna Temple! The Toronto Hare Krishna Temple is excited to share that we will be welcoming two special guests to our community this week. HG Jambavan das and HG Gadhadara Pandit das will be visiting Toronto and conducting various programs throughout the city. Jambavan Das is a Sanskrit translator and expert in Gaudiya Vaishnava theology. He is an expert public speaker and has been a missionary and active member with ISKCON for many years. He is also a professional financial advisor. He is an expert teacher and has been trained to conduct formal Vedic fire yajnas (fire sacrifices where grains and various other items are offered into fire, accompanied by the chanting of mantras).